Can Saccadic Eye Movements (SIRE Effects) Enhance Implicit and Explicit Memory? Contemporary experimental memory research has found an intriguing way to enhance mnemonic performance. Starting with Steven Christman and colleagues at the University of Toledo in 2003, investigations have established that goal-directed horizontal saccades (rapid, jerky eye movements) towards a moving target on a computer screen improves recall of subsequently learned material. Theorists often refer to this as the SIRE effect (Saccade Induced Retrieval Enhancement), after Lyle & Martin (2010). Consideration of relevant literature reveals that enhanced memory occurs across a range of experimental situations and tests designed to assess explicit memory. Explicit memory denotes a form of memory retrieval that is intentional and accompanied by conscious awareness. For example, when asked to recall the events of one’s birthday last year, or what happened on the way to work earlier in the morning. This is contrasted with implicit memory, in which retrieval is incidental and often not accompanied by conscious awareness. This form of memory is often intact in amnesic individuals even when the ability to recall consciously past information and episodes is lost. Implicit memory also operates in those without brain damage and shows clear dissociations (differences) to explicit memory. Memory can also differ as a function of processing activity during encoding (study) and retrieval (test). In cognitive research, this distinction is highlighted by transfer appropriate processing theories of memory. These theories explain successful memory as coming about from the overlap in cognitive or neural activity between study and testing; the greater the degree of overlap, the more successful the memory attempt will be. The current article in Brain & Cognition assessed for the first time whether SIRE effects were limited to particular types of memory and processing activity. To accomplish this experimentally, subjects viewed a series of words with instructions to read them as they appeared on the screen. The words were selected from various categories (e.g., fruits – MANGO, CHERRY; vehicles – LORRY, SHIP, etc.) but were shown randomly intermixed. No hint was given about any upcoming test or eye-movements. Following this, random allocation placed subjects into either a saccadic eye movement or eye fixation condition. In the saccadic eye movement condition, the subjects were required to follow a moving target from side to side, as it appeared on computer screen. Eye movement was done by using their eyes only without head movements. This lasted 30 s. Finally, the subjects were placed into one of four experimental groups; consistent with previous research, these assessed different types and processes of memory. See Figure 1 for an example. Figure 1. Different tests were given to the subjects that measure either explicit or implicit memory and conceptual vs perceptual memory. 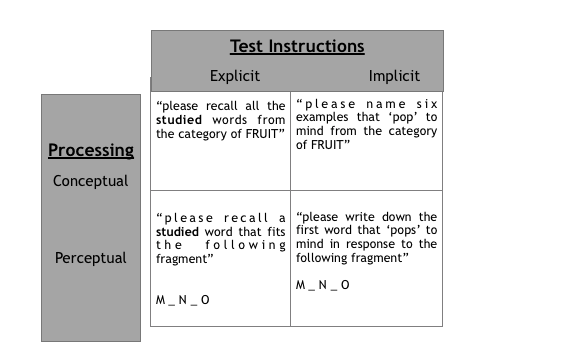 The figure illustrates the types of memory/processing and examples of experimental instructions and test cues. Replicating previous work, SIRE effects occurred. However, these were limited to only one of the experimental conditions. Specifically, when the test required the explicit and intentional retrieval of studied information and when processing demands were conceptual. One account is based on the notion that horizontal saccadic eye movements increase hemispheric interaction via the corpus callosum, and a consequence of this is improved performance on any test for which such interactions are important. According to some cognitive neuroscience theories, explicit or episodic memory tasks are considered to be dependent on such interactions. However, without some additional assumptions and elaboration, this explanation cannot fully account for the finding that only conceptual explicit memory was enhanced. In addition, direct measurement of interhemispheric coherence using EEG has found only rather weak support and is far from established. Another explanation that has gained traction is that goal-directed saccades influence top-down processing in the frontoparietal network. In this account, eye movements initially activate the frontal eye fields that in turn potentiate activity in the parietal lobes. Neuroimaging work has shown such frontal-parietal interactions to occur and relate to various aspects of memory performance. Within this theory, SIRE effects are most likely when memory retrieval requires top-down support in order to access weak memory traces or overcame interference from competing memories. That a brief period of saccadic eye movements can enhance certain types of memory (at least temporarily – there is no indication that the effects will be long-term or constitute a form of cognitive training) has important potential applications. For example, improving eye-witness recall (indeed a number of experiments have shown that this is the case) or personal memory for autobiographical events. Although experiments on SIRE effects have been ongoing since 2003 and a good range of evidence has been accumulated, much more work is required to establish its cognitive boundary conditions, more precise neural underpinnings and effectiveness outside the laboratory. 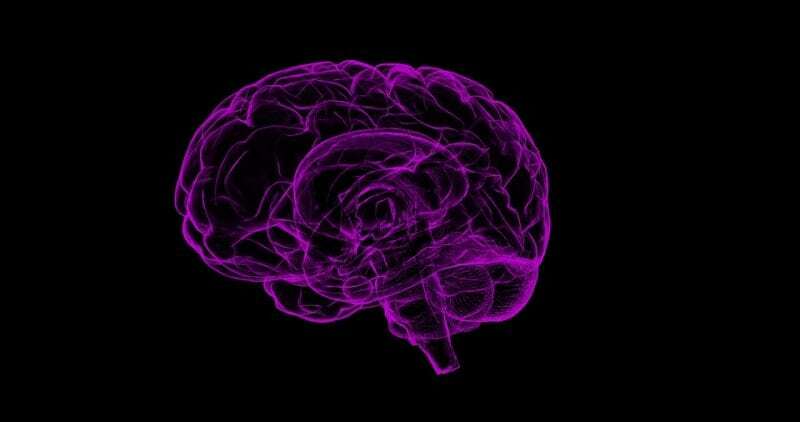 These findings are described in the article entitled Effects of Saccade Induced Retrieval Enhancement on conceptual and perceptual tests of explicit & implicit memory, recently published in the journal Brain and Cognition. This work was conducted by Andrew Parker, Daniel Powell, and Neil Dagnall from Manchester Metropolitan University. Andrew is a senior lecturer at Manchester Metropolitan University. Daniel is affiliated with Manchester Metropolitan University. Neil is a reader in applied cognitive psychology at Manchester Metropolitan University.